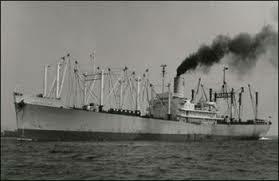 Stephen Davies: The Isthmian Shipping Line (1910-1974) was initially a strange, hybrid beast – American but set up in London with a British management agency, the Federal Steam Navigation Co (ex-the famed Money & Wigram, itself an offshoot of the EIC when that lost its monopoly in 1833). I think the key point is its connection with US Steel – in effect an at-one-remove house line. Fans of the company have a wonderful site, linked below, with an excellent and well-informed timeline and all the known images of its ships. One thing that stands out is the sheer amount of litigation in which the company was involved! The line has its first mention, in HK, on 11.1.1912 about a failure to organize finance for the new line, However, that must have been soon sorted out because on 24.1.1912 there is a notice to consignees in the SCMP by the line advertising for cargo, so at least initially it clearly operated to HK. However, there was possibly an hiatus for after that first consignment note, with agents Shewan, Tomes & Co., there is a gap (though frequent stories about the line) and an SCMP story 31.7.1939 suggests its main route was US to the Philippines. The next consignment advertisement doesn’t appear until 1931 when the agents are the Bank Line. HF: It would be of interest to have further information about the company in Hong Kong. Office location, people involved, shipping routes operated to and from HK? 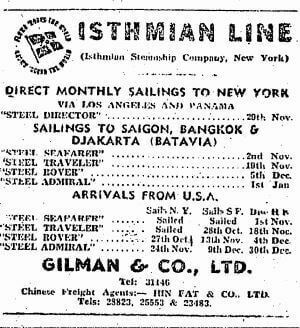 “The Isthmian Steamship Company was a shipping company founded by US Steel in 1910. Isthmian Steamship was the brainchild of US Steel President James A. Farrell, who had connections with the maritime industry through his father’s trade as a ship’s master. Farrell realized that US Steel could save substantial sums of money by owning its own fleet of freighters, rather than chartering cargo space from other companies. Farrell named the company after the Isthmus of Panama, in honour of America’s recent construction achievement, the Panama Canal. Farrell headquartered Isthmian Steamship in London, partly in order to take advantage of Great Britain’s respected name in the industry, and partly to benefit from Britain’s long history of maritime experience. Management of the company was assigned to the British Federal Steam Navigation Co Ltd, a company which traced its own origins back as far as 1782 with the British East India Company. The US end of Farrell’s new company was managed by the Norton Lilly Agency. The company’s first ship was the SS Bantu, a British vessel launched in 1902 and purchased by US Steel in 1907 for a reputed £24,000. By 1914, the company had purchased six additional ships – Kentra, Buenaventura, Santa Rosalia, Charleton Hall, Craston Hall and the sleek cargo liner Crofton Hall – all sturdy British steamships. With the outbreak of World War 1 however, Farrell brought the company back under the protective cover of the flag of America, which was not at the time a belligerent. The company would continue to expand its operations in the ensuing decades. In 1956 however, the by then highly lucrative company was sold to States Marine Lines. US Steel justified the sale on the grounds that Isthmian’s overall usefulness had diminished, as it now carried only a fraction of the corporation’s exports. This article was first posted on 8th February 2018.